So, when I went and visited Toronto for the LG G7 sneak peek one of the main things they talked about was their AI. To show their dedication to AI they've just invested in a new LG AI Research Lab in Toronto. 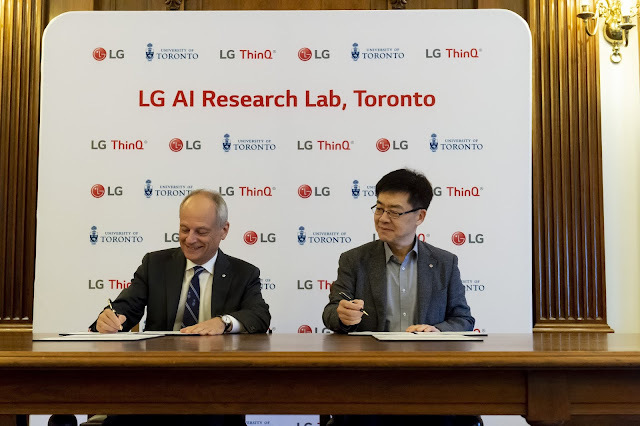 TORONTO, Aug. 1, 2018 – Global innovator LG Electronics Inc. (LG) is poised to define the future of artificial intelligence (AI) for consumers and businesses in the years ahead with the establishment of a major new AI research presence in North America in collaboration with leaders in academia and start-ups. This week marks the launch of the new LG Electronics AI Research Lab in Canada, an extension of the newly expanded LG Silicon Valley AI Lab in Santa Clara, Calif. Supporting LG’s vision of AI as a key future growth engine, the North American labs further enhance LG’s global research capabilities, which include AI labs in South Korea, India and Russia. In addition, LG is entering into a new research partnership with the University of Toronto, which is recognized worldwide for its AI and machine learning expertise, particularly in the area of deep learning. “AI will ultimately touch everybody’s lives, transforming the way we live, work and play,” said LG Electronics President and Chief Technology Officer Dr. I.P. Park. “Early implementations of AI in connected devices today are setting the stage for tomorrow’s smart cities, smart homes, smart businesses and smart devices, all with capabilities that no one has even dreamed of yet.” He said the North American labs and LG’s research partnership with the University of Toronto will play a key role in developing source technologies defining that future. Under its five-year, multi-million-dollar research partnership with the University of Toronto, LG will build on its Open Platform-Open Partnership-Open Connectivity strategy to expand the AI ecosystem. The new lab will capitalize on the expertise of researchers at the University of Toronto who will now have the opportunity to work collaboratively with LG’s growing U.S. and Canadian AI R&D teams. Complementing this work, LG intends to collaborate with and invest in North American start-ups.